Air Force Vet Becomes 1st African American Elected to Statewide Office in Ky.
Kentucky's new lieutenant governor-elect is a black Republican woman, the first black person ever elected to statewide office there, the Washington Post reports. 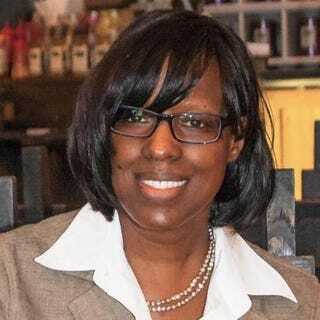 Jenean Hampton had previously been named in the Republican State Leadership Committee's "15 in '15: Races to Watch" report, meant to highlight outstanding women and diverse candidates from around the country, a Republican National Committee press release notes. "Kentuckians across the state cast their ballots today in favor of the ticket they believed would put their state back on the right track, and I am thrilled to congratulate Matt Bevin and Jenean Hampton on their victories this evening. Bevin and Hampton will serve the Bluegrass State well, bringing with them impressive resumes, conservative, common-sense solutions and a proven commitment to our nation," RSLC President Matt Walter said in a statement on behalf of the Republican Lieutenant Governors Association. A Detroit native, Hampton wrote computer code and tested software for the U.S. Air Force. After she was honorably discharged, Hampton began a 19-year career in the corrugated-packing industry. The veteran doesn't have much political experience. In 2014, the Washington Post notes, she ran for her first political office, state representative, but lost. Still, Republicans seem excited to have her on the team, with RNC Chairman Reince Priebus tweeting out his congratulations.